Living Well wants you to feel your best every day - even during cold and flu season. Read their cold and flu prevention tips and take advantage of their trial offer for TYLENOL® Extra Strength eZ TABS. 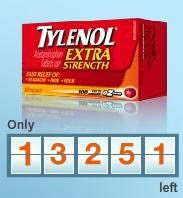 TYLENOL® Extra Strength eZ TABS are sweet-coated, easy to swallow, and deliver fast, effective pain and fever relief. Supplies are limited - get your trial offer today! Allow 2-3 weeks for delivery. Maximum 1 trial offer per Canadian household address. While you are waiting for your freebies to arrive, take advantage of the printable freebies, the printable coupons for local free offers, and local offers that you can pick up.